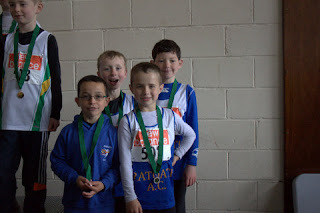 The Leinster team event was held last Monday in Tullamore, We had 4 teams competing from the club and all teams came away with medals, Our u9 boys didn’t have much luck on the day but still managed to finish 3rd, well done to Fionn Heffernan, Gavin Witter, Charlie O’ Connor and James Kelly. Our u10 girls were in great form and won their first Leinster title with a terrific all round team effort from Cara O’ Sullivan, Ciara Coroner, Caoimhe Fitzsimons and Eline Lund. 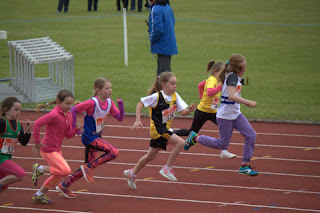 The u11 girls only missed out on the gold by 1 point with great track and field performances from Niamh Murray, Sophie Quinn, Laura Kelly, Aishling Strafford and Sophie Green. The u13 girls also took gold, however a late change to the relay rules and points allocation after presentation suggested that they finished 2nd, the girls were already well down the road and were happy to take home their gold medals. Well done to all athletes and thanks to parents who gave up their bank holiday Monday for this event.